A house lit up with Christmas lights is a beautiful sight to behold. 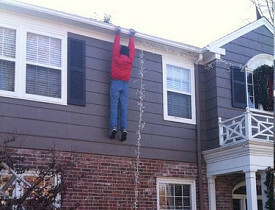 But stringing lights across your roof and around your home can be a real safety hazard if you’re not careful. So before you flip the switch to dazzle friends and family with your spectacular light show, take a few moments to run through this quick safety checklist. ● The combination of electric lights and a tinder-dry tree can be deadly. There are 250 Christmas tree fires and 14 related deaths each year, according to the U.S. Fire Administration. So keep your tree well-watered. Not only will it stay fresh and green, but it might also keep your house from burning down. ● If bulbs have burned out, replace them right away, but double-check that you're purchasing the correct wattage bulbs. ● Because water and debris can get into outdoor sockets, ensure outdoor lights are plugged into a ground fault circuit interrupter outlet to reduce the risk of shorts and shocks. Hire a licensed electrician if you need to install GFCI outlets. ● Don’t hang lights using tacks, nails or screws, which can pierce the cable and become electrified. Use insulated hooks instead. ● When running extension cords along the ground, take care to elevate plugs and connectors with a brick, to keep snow, water and debris out of the connections. ● Check that lights have been rated by a testing laboratory. You can see a list of federally recognized labs on the Occupational Safety & Health Administration’s website. ● Don’t leave Christmas lights on when you go to bed at night or when you leave the house. ● When you put your lights back into storage after the holidays, place them in a well-sealed container to prevent possible water damage and to block hungry rodents looking to turn the cords into lunch.